Triad Guitar Trio — Laguna Beach Live! 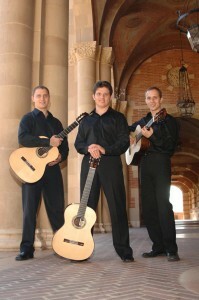 Triada combines the unique talents of Nikola, Petar and Vasil Chekardzhikov, forming one of the most brilliant guitar ensembles now performing. The three brothers are individually virtuoso guitarists, and their intuitive sense of ensemble gives a synergy that makes their concerts very special and exciting events. Performances by Triada feature innovative repertoire, including traditional classics, modern favorites, and vibrant, colorful ethnic music to engage and delight any audience. Programs usually include powerful works that composers have written specifically for this superlative ensemble. The three are former members of the guitar quartet “Four of a Kind” with their sister Petya. A heavy schedule of concerts, TV and radio appearances in Bulgaria led to concert tours in Europe from 1994 to 1996. Since coming to the United States, the trio has performed at some of the most prestigious concert series and classical guitar forums in the country. Their CDs is regularly aired in over 100 radio stations in the US. The brothers studied guitar from early childhood with professor Ljuben Haralambiev in Varna, Bulgaria. In America they completed graduate studies at Cal State Fullerton with David Grimes. They have also worked in master classes with internationally known guitarists such as Scott Tennant, Bill Kanengiser, Roland Dyens, Maximo Diego Pujol, Assad Brothers, among others. Click Here for a music sample.